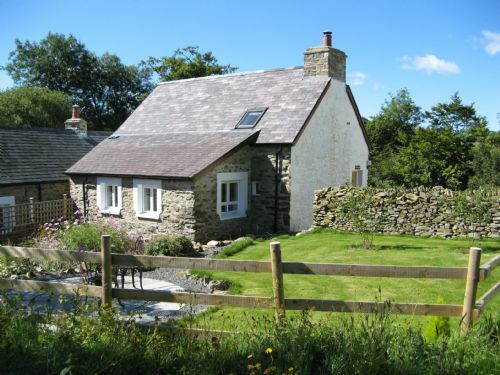 Banceithin is a 10 acre smallholding nestled in a secluded valley in the heart of Welsh Wales, between the Cambrian Mountains to the east and Cardigan Bay to the west. We have two luxury self-catering cottages, Hen Ffermdy (sleeps 2) and Cwt Mochyn (sleeps 6); both are renovated traditional Welsh stone buildings with modern interior design and facilities blending with the character and original features with just the right amount of history left in the mix. We are Gold members of the Green Tourism Business Scheme and proud winners of their Best Self-Catering Accommodation Goldstar Award. The smallholding is a wildlife haven & in a dark skies area; perfect for birdwatching & stargazing. A friendly welcome by the owners, A cosy and relaxing cottage with plenty of local interests to keep most visitors busy. Our stay at Hen Ffermdy was just what we needed. Peaceful, comfortable, cosy in a lovely location. The information provided was amazing, the ability to order some food was really helpful. We are already plotting to return. Had a lovely few days staying in this delightful cottage. Very peaceful location,cottage clean and very well equipped. Having stayed in the other cottage with family this was our chance to escape as a couple (this was our opportunity for a honeymoon after all!). Location is lovely. Peaceful and beautiful. Cottage is great. Spacious enough but feels cosy. Always feel like nothing is too much trouble and EVERYTHING has been considered. Local area is lovely. Would love to spend more time here. Thoroughly enjoyed my stay. Ethics and aesthetics DO go together. And so much more to explore. Delightful. Very impressed by the owners Green commitment and attention to environmental detail. The home made foods on offer were a great help and so tasty and flavoursome . Would recommend as a relaxing holiday centre, lots of local walks. The cottage was clean, warm, spacious for 2, well equipped and provided excellent information for exploring the local coast and countryside as well as telescope and binoculars to use if needed. Very friendly welcome from David and Philippa as well as Teri the dog and several hens. Only one word to describe Hen Ffermdy...... PERFECT! Perfect location, perfect hosts and the cottage was better than any photo. Totally recommended. Considering returning with the family to the larger cottage next door. Our third visit to Banceithin, and as ever it was very comfortable and relaxing. Minimal internet and mobile signal meant we really switched off from work and got a lot of reading done by the log burner, and we enjoyed exploring, revisiting a few favourite spots and discovering more. The pre-ordered breakfast pack was so meaty we got three meals out of it, and a cottage pie from the freezer was the perfect easy dinner on the first night. We'll be back! We really enjoyed our stay at Hen Ffermdy. The cottage is enormous for two with all you need with great touches like an old record player (with LPs) & an antique Underwood typewriter (really cool if you are House of Cards fan!). Well equipped kitchen, good shower and comfortable bed. Lovely wood burner in the open plan downstairs really heats up the place quickly. Phillipa & David were great hosts and happy to give us a guided tour round their smallholding - so passionate about minimising the environmental impact. It is off the beaten track but that's exactly why you would go there. Easy to go "off grid" & escape the e-mails and calls to recharge your batteries. The perfect location for a week away from it all! A wonderful little cottage with some interesting features. We loved the spiral staircase leading to the mezzanine floor where the bedroom and bathroom were located. A second toilet with wash basin downstairs was greatly appreciated too. Couldn't ask for more in the way of cooking facilities - everything was there, and it didn't take long to find out how to operate the oven and hob. Having access to a supply of home cooked frozen meals was also a godsend as it meant that we didn't have to spend time during the day traipsing around a supermarket or having to search out local shops, not that that would have been a problem. Arriving at the cottage on Day 1 was easy, thanks to good directions from Sykes Cottages. We enjoyed exploring the farm and were entertained by the pigs! Teri, the Border Collie always gave us a lovely welcome home whenever we saw her after a day out. All in all, a great place, with lovely surroundings, to spend a week or more and in an area well suited to walking and bird watching. The astronomical telescope was a great nevelty! We will almost certainly be back for another holiday. A big 'Thank you' to David and Phillipa. Out of many self catering cottages where we have stayed in the U.K. this has been the best by far! The owners have provided everything one could think of to make a stay there very comfortable. It is very well equipped and is the ideal place to stay if one needs a quiet holiday away from Broadband. The only slight niggle we had was the lack of a mattress protector which we thought should have been provided as so many people will be using the bed. This is a cottage we highly recommend to anyone who loves a quiet stay in the country around nature. Thank you for your lovely comments. We're so glad you found the cottage so comfortable. Regarding your comment about the lack of mattress protector, there is usually one in place. However, on the day of the change-over for your stay it was necessary for me to remove it and, unfortunately, I did not have a spare one available to use for your stay. I apologise that this caused a "niggle" for you. I assure you that there will be one in place if you return. This was a family booking both cottages. The accommodation is well-equipped, clean and comfortable. The owners were friendly and welcoming. My only reservation is that the cottages are out of the way and this may be a disadvantage with young children. You really need to get in the car to reach other amenities though there are plenty of things to do in the surrounding area if you don't mind a car journey. A great place for walking if you have children who like walking !We had a lovely week and would recommend it as a delighful place to stay and chill out with no WIFI - though that may be a disadvantage for some it was a treat for us. We had such a chilled week staying at Hen Ffermdy. What a lovely place and the welcome goodies from Phillipa and David were very good. The weather was a bit hit and miss but we still enjoyed our walks and not to be missed the various red kite feeding stations. Every thing about the cottage say's relaxe and enjoy, which is just what we did ! . So thank you both for sharing your lovely cottages . We found everything that we could ever need for a romantic few days,but we did have difficulty with the log burner,i think this was due to the logs being damp but it didn't spoil it as the back up heating was very good.we would grade all as excellent. Decided to get away from it all for Christmas. This was our third trip but first time in the smaller cottage. We weren't disappointed. Love it here and will be back. Our 4th visit and it did not disappoint. We love the peace and quiet, watching the birds on the feeder from the kitchen window, having a nostalgia-fest playing our old LPs, playing darts and just sitting in the garden with a cup of tea. Yes, we were able to do that even in October, we had such lovely weather! And there are extra delights at Banceithin since we were last there, including a bench by the river where you can watch the sun set. If you are looking for a eco-friendly place to stay, look no further. There is wonderful Banceithin produce to enjoy too - eggs, sausages, veggies, preserves, honey. Dave's pies and curries are super-delicious, as is Philippa's bara brith. We came home much refreshed. The most relaxing cottage holiday we have known . Property , area, things to do and see , hosts - all fantastic . We recommend and just keep going back . Second visit - and if anything, even better! We've now stayed in mid-winter and late summer, so we know that the cottage is a perfect place to stay at any time of year. Philippa and David provide everything one needs to have a relaxing time, from delicious home-cooked food (which can be popped into the oven) to detailed walking guides, from logs for the fire to a lift to the pub, if needed. We stayed in every night, and could feel ourselves relax with each passing day. This time, I explored the nearby countryside - everywhere you go, there's a lovely view of mountains, hills or the sea - and the roads are blissfully quiet. Very warmly recommended! This is a fabulous location and cottages combined with extras and wonderful customer service. It is idyllic and not too far from amenities and lovely seaside towns. Comfortable cottage in a quiet rural location. Some interesting features make it stand out from the norm i.e. gramophone and records, retro furniture, table tennis and frozen meals/local produce. With easy access to the coast and Cambrian hills. Recommended. The house has everything you need and more. The location is rural but not far from the beach. We enjoyed relaxing in the garden, local walks, cooking using the pre ordered fruit and vegetables and exploring local area. Dave and Phillipa are available if you need them or want to chat but not intrusive. Would and have recommended to friends and hope to return in the future to recharge our batteries. Lovely stay in a very comfortable cottage! We had a lovely time, and the cottage was so comfortable that we quite forgot about its 'Eco' credentials, proving that being green needn't mean hardship! The welcoming Bara Brith went down very well, as did the breakfast pack - the sausages were especially excellent - as was the Mutton Bhuna we bought from the freezer for dinner one night. It was lovely to wander around the smallholding and chat to the pigs, sheep and chickens, and the surrounding countryside was just perfect. Aberaeron, just a short drive away, was a perfect place to sit and watch the world go by with fish and chips or ice cream. All in all a great base for exploring the area, or just relaxing on the farm away from the distraction of emails! Thank you David and Philippa for an excellent holiday! my partner and I had a great time visiting Banceithin. It was a very late booking due to other commitments but were extremely chuffed with our choice. The Banceithin bible was a great and help with the local walks and tips for the best beaches. We also really digged (pun intended) the vibe of the small holding and sustainability, the award for green tourism was a bit of a swaying factor. I particularly enjoyed being able to watch some nature from the kitchen window. We had a really comfortable stay at Banceithin. Cottage was warm and cosy and very well equipped with everything we needed. Owners were really friendly and helpful and we were made to feel very welcome. Local produce available to pre-order and home cooked meals to purchase from the freezer were one of several highlights of the holiday. Perfect location to explore West Wales. Our 3rd or 4th stay. Close to the sea and close to Cambrians in a peaceful location. There are not many places where you can eat the produce directly raised on the farm. Very tasty. Excellent accommodation, super friendly hosts. We were so in need of a break, and this little cottage, tucked away in the Welsh countryside was the perfect escape. Lovely cottage, everything you need on site. It's pretty remote but lots of tips and suggestions for things to do inside the huge (and hugely brilliant) Banceithin 'Bible'. Our 4th visit to our favourite holiday cottage. This was our 4th stay in Hen Ffermdy and we've booked a fifth. We love it here. The clean air, birdsong and starry skies together with a super holiday cottage make this our favourite place to stay. We are full of admiration for what David and Philippa have achieved at Banceithin and they deserve all the gold awards they have won. The attention to detail in the cottage is amazing from a welcome homemade cake to a calendar by a local artist. Their information folder is a blueprint for how it should be done. This is as good as holiday accommodation gets.